VortexBox is a Fedora-based Linux distribution that turns an unused computer into an easy-to-use music server or jukebox. Once VortexBox has been loaded it will automatically rip CDs to FLAC and MP3 files, ID3-tag the files, and download the cover art. VortexBox will then serve the files to network media player. The file can also be streamed to a Windows or Mac OS X system. Rate this project Kai Hendry has announced the release of Webconverger 22.0, the latest stable version of the project's Debian-based distribution for Internet kiosks: "Webconverger 22 release. For those wise people who are using the automatically upgrading install version, you should have received all the benefits below. So this new release will help keep bandwidth low for new install users, since they don't need to download upgrades up to this release from the previous 21.0 release. And as for the non-upgrading static live users, please upgrade to keep users abreast with the latest web technologies and security updates. What's new: grabdrag API for better touch screen support; Emoji fonts; Firefox 25 and Flash security updates. Please download the latest release and we would love to hear from you!" Here is the brief release announcement. Download link: webc-22.0.iso (352MB, MD5). 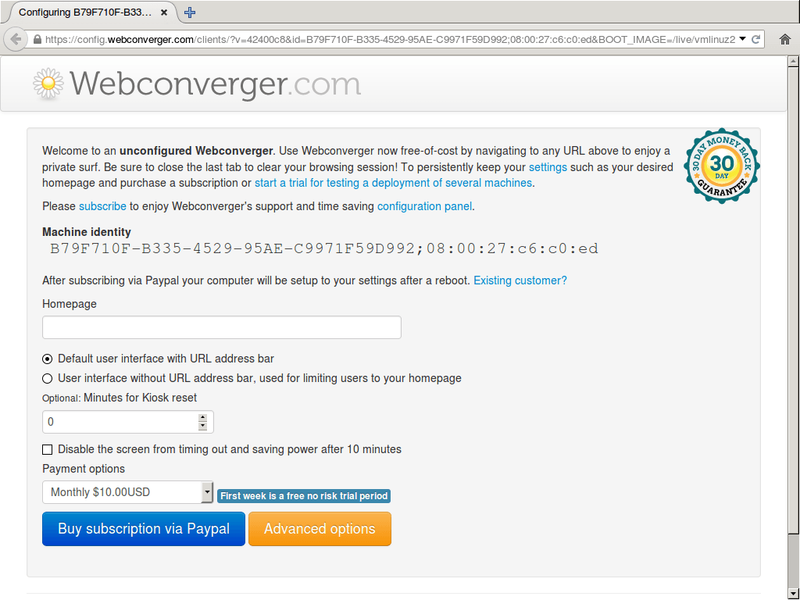 The Webconverger project has released a new version of its Debian-based web kiosk distribution. The new release, Webconverger 35.1, features better hardware support (courtesy of the Linux 4.5 kernel), Firefox 46 and various security updates. This release also introduces a commercial aspect: "From yesterday, configuring a device requires payment authorization. The new Stripe based billing system should make it painless for new subscribers who have just one or two machines to purchase a subscription. If you do encounter a problem, please email support. The trial is 30 days and the initial price is $9.99USD a month. Our pricing is flexible and for large deployments and for the likes of non-profits and charities, we ask you please to get in contact with sales@webconverger.com. We are hoping this new revenue stream will give us the resources to tackle our issue list, improve the Raspberry PI & Android versions and grow." The Webconverger software is still free to download and try. Further details can be found in the project's release announcement. Download (SHA1): webc-35.1.iso (450MB, pkglist). 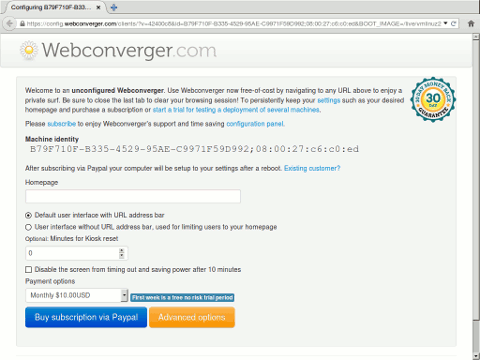 Kai Hendry has announced the release of Webconverger 34.0, the latest stable release of the specialist Linux distribution designed for web kiosks and featuring the latest Firefox web browser: "Webconverger 34 release. With the arrival of free SSL certificates from Let's Encrypt, together with a kind offer from Fastly CDN to help distribute Webconverger since we are an open-source project, we are now serving our ISO images over SSL. Serving over SSL greatly reduces the chance of some malicious actor intercepting your connection to our server and giving you a corrupt version of our ISO image. That has never happened to our knowledge, though why not make it even less likely going into the future? Updates include: Firefox 44; ongoing security updates including the recent CVE-2015-7547 which we patched quickly thanks to the fantastic work of the Debian security team; added Cambodian (Khmer) fonts via Google's fonts-noto package." Read the rest of the release announcement for more details and some hints concerning the project's future plans. Download from here: webc-34.0.iso (411MB, SHA1, pkglist). Kai Hendry has announced the release of Webconverger 32.0, the latest stable release of the specialist Linux distribution for web kiosks - now with Firefox 41.0 and improved web browser privacy features: "Webconverger 32 release. Prompted by the disturbing privacy defaults in Windows 10 and an enquiry whether Webconverger leaked any intranet information, we reviewed Firefox defaults. This review was accomplished with Wireshark, a tool that allows us to analyse every packet leaving and entering a Webconverger instance. We did notice a lot of network noise chatter caused by safe browsing, location services and a media codec download. We reduced this chatter by turning off these automatic Firefox services. Finally, an upgrade process on an install was packet sniffed. Strictly speaking, these Firefox defaults don't leak any private information and elements like safe browsing should give an extra layer of malware protection, but in practice the network noise generated by these services are too risky for security." Continue to the release announcement for full details. Download: webc-32.0.iso (407MB, SHA1, pkglist). Kai Hendry has announced the release of Webconverger 31.0, the latest update of the project's specialist Linux distribution for web kiosks: "Webconverger 31 release. Two months ago was our momentous Jessie-based Webconverger 30 release and since then we've: fixed an issue with printing; pushed Firefox 39; further locked down some new Mozilla anti-features like social services, pocket and hello URLs; received a fantastic endorsement from the (Internet) famous security pundit SwiftOnSecurity. What next? We could really do with your feedback, help and support on a couple of goals for the next release: making wireless setups easier; improve boot times; perhaps work on efficient sharing a single machine with multiseat if there is a demand for it. Managed to integrate the EETI eGalaxTouch driver for some models of resistive touchscreens. It works well as your can see by this touch screen demo video and it's typically deployed in point of sales in retail. Unfortunately the driver is in a private branch since the end user of license is very limited and a good case study of how not to write a license." Here is the full release announcement. Download: webc-31.0.iso (409MB, SHA1, pkglist). Kai Hendry has announced the availability of Webconverger 30.0, a major new update of the specialist Linux distribution made for web kiosks. This is the project's first release that is based on Debian GNU/Linux 8.0. From the release announcement: "Webconverger 30 release. As announced on Twitter earlier this month, we achieved a significant technical accomplishment for Debian-based derivatives doing the dreaded dist-upgrade. A seamless upgrade. No config changes. No hoop jumping. No sweat. If you are running the install version that upgrades itself, you will now be based on Debian 'Jessie'. The new major release of the underlying open Debian platform for Firefox that will be the basis for Webconverger for the next 3 years. So we skipped version 29 and 30 marks the fact that we are on Debian 'Jessie' 8.0. Hopefully the only difference you will notice is that this new release should run a bit better on newer hardware. There is an unfortunate caveat that if you are using an i486 kernel-based Webconverger, your upgrade will not go smoothly. We noticed that most people using the i486 kernel were doing so mistakenly and we've asked the very few people that are affected to please simply re-install with any version since 25." Download the live CD image from here: webc-30.0.iso (407MB, SHA1, pkglist). Kai Hendry has announced the release of Webconverger 28.0, the latest update of the specialist Linux distribution designed for web kiosks, based on Debian 7: "28.0's most exciting new feature is opted in with the instantupdate API option which allows you to change the homepage remotely for one or many of your devices in an instant. No reboot required. The technology behind this is Websockets and the service runs upon wss.webconverger.com. The detailed changelog between 27.1 and 28.0 otherwise shows a raft of security updates and minor bug fixes. If you are Live user, you really must update for the Flash fixes alone. For install users, you should have nothing to worry about. Do double check the version on about: in case something is amiss. It's never a bad idea to re-install (it only takes a couple of minutes)! Coming soon: a major update where we will upgrade from Debian 'Wheezy' to 'Jessie' smoothly. Work in our testing branch is well underway and we hope to release the next version of 'stable soon after Debian makes the switch." Here is the full release announcement. Download: webc-28.0.iso (409MB, SHA256). Kai Hendry has announced the release of Webconverger 27.1, the latest update of the single-purpose, Debian-based Linux distribution designed for web kiosks - now with updated Linux kernel, version 3.16.7: "Webconverger 27 release. Webconverger wishes you a happy new year and gives the gift of a better web experience. Highlights of Webconverger 27.1: better Intel support, we do recommend NUC hardware and this update will give more flexibility with external displays; rebranded to our new logo and do check out our refreshed website; includes Firefox 34 with accompanying security fixes; new 3.16 kernel for better hardware support; new tabswitch= API, a convenient function to switch between tabs when used for digital signage; important Flash security updates, so important that Mozilla blocked versions below 11.2.202.425; Gujarati font support." See the complete release announcement for more information and screenshots. Download the live CD image from here: webc-27.1.iso (406MB, SHA256, pkglist). Kai Hendry has announced the release of Webconverger 26.0, a new update of the specialist distribution designed for web-only computers - now with Firefox 32.0: "Webconverger 26 release. Highlights of this 26.0 signed and tagged snapshot: revised boot menu, helping you get started with Neon, our web signage product; Firefox 32.0; basic proxy authentication - a customer wanted this to fit into their complex Windows deployment, so now you have it too; tab right click menu removed to make user interface simpler; bug fixes to the print button and the job scheduler API (cron=); the usual stable security updates and Adobe Flash, with an additional font to make Flash video text render correctly. Please ask your web developers to switch to HTML video. If you host your video on YouTube, you can make embeds use HTML5 with a html5=1 argument." Read the rest of the release announcement to learn about a known issue and the project's upcoming plans. Download link: webc-26.0.iso (385MB, SHA256). Kai Hendry has announced the release of Webconverger 25.0, the latest version of the specialist distribution for web kiosks, based on stable Debian GNU/Linux 7.0: "Webconverger 25 release. Highlights of this 25.0 signed and tagged release, making Webconverger an even better web kiosk: new super simple whitelist= filtering option; new numlock API, to assist deployments in banks and such for numpad data entry; incorporated Firefox 29/30-based Australis user interface refresh, being very careful to minimise its impact on our conservative user base; downsized 397 MB to 375 MB, losing around 22 MB; NVIDIA video card support restored with the Nouveau driver; various SSL and flash security updates." Read the full release announcement which includes a link to a raw changelog on GitHub. Download the live CD image from here: webc-25.0.iso (375MB, MD5).